Brother SE400 combination Computerized Sewing and Embroidery machine has been constructed in such a way to help you customizing your sewing projects. This model would definitely embellish your projects affordably. 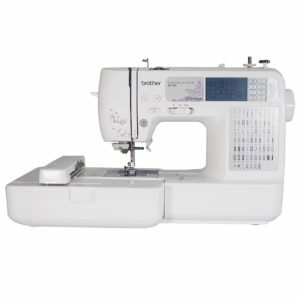 This is the most reliable, feature-rich and budget-friendly modelwould deliver a full range of sewing features and will provide you with the ability to embellish your home decors and clothing. The incredible functionality of the current sewing machine from the world’s leading manufacturer would make this as a terrific and valuable product in the current market. With far more features, it could be hard for anyone to imagine what this model could offer. The current model of sewing machine is completely computerized and is far more advanced than many of the basic models like Janome 2212 sewing machine. This machine which comes with the port for computer connectivity is containing an easy-to-use LCD touch screen display. The workplace with this sewing machine will be brightly lit. This sewing machine has been in-built with as many as 67 sewing stitches along with 70 in-built embroidery designs with which you can be able to enjoy comprehensive sewing functions. This 120 V sewing machine would reach your hands with a 25-year limited warranty and a bilingual user manual. This is the most reliable and durable sewing machine model from Brother. In-built Stitches: The current sewing machine has been in-built with 67 unique sewing stitches with as many as 98 stitch functions. These stitch functions will provide you with an ability to embellish home decors, clothing as well as gifts in an easier way. Embroidery Design Library: With this sewing machine, you can choose from the in-built embroidery design library which includes 70 decorative designs, 120 frame pattern combinations along with 5 lettering fonts. With this machine, you also have the choice of import additional designs from your PC. Worry-free Threading: For the purpose of threading, you can forget about the tweezers and your magnifying glasses totally. The automatic needle threader will thread your machine with just one touch. Seven Point Feed Dogs: Brother SE400 would provide you with a smooth fabric feeding with the seven point feed dogs with which you can easily advance your fabric as per the sewing machine reviews. Bobbin Preparation Made Easy: The current model would offer you with convenient bobbin winding system with which you could prepare bobbins very quickly. Reliable Bobbin System: The jam-resistant, drop-in and quick-set bobbin system would offer you with smooth sailing with which you will have no fishing for bobbin thread. Light-Weight: In spite of the loads of features, this machine is also light-weighted which is weighing just around 12.4 pounds. This makes it easier for you to transport your machine from one place to another. There are some additional extraordinary features in this sewing machine which are responsible for making this as the best sewing machine in the current market. Embroidery Area: The embroidery area in this machine is more spacious (4 X 4 inches) which would give your creative freedom to run free. Touch Screen Display: The current sewing machine features an easy-to-use backlit LCD touch screen display which would allow you to access all the in-built designs in an easier way. With this, you will also be able to control design editing features as well as view tutorials. Brighter Workspace: The brightly lit workspace will eliminate the need for task lights since the brilliant light would flood the needle area. Computer Connectivity: Since you can be able to connect your sewing machine with your computer, you are allowed to keep your machine up to date. With this feature, you can download machine updates and you can import designs. Automatic Thread Cutter: The one-touch automatic thread cutter would cut your top and bobbin thread with much ease. Assortment of Included Accessories: In addition to the above included options, you will be provided with a full assortment of included accessories. The set contains the following accessories: 4 X 4 inches embroidery hoop; Embroidery arm; Soft cover; Buttonhole foot; Over-casting foot; Zipper foot; Button fitting foot; Monogramming foot; Blind stitch foot; Embroidery foot; Bilingual operation manual. This machine will be a great option for beginners as well as experts. The beginners can be able to learn quickly by just peeping into the operation manual. With the lots of features like automatic needle threading, easy bobbin winding system and automatic thread cutter, you will find it easier to handle the head breaking tasks of sewing process. You can be able to customize your projects with the options of downloading designs from PC in an easier way. Thus, installing and handling your sewing machine will not be difficult for any user irrespective of experiences. USB port will provide you with an option for easy updates and design downloads. This machine has a combination of sewing and embroidery functionalities. This sewing machine comes with a selection of utility stitches which are suitable for various home projects. You can be able to purchase this product at a good discount when you opt buying this machine from www.amazon.com. Presser foot pressure of this machine is preset and cannot be adjusted. No hard cover case is included with this machine. With Brother SE400 Combination Embroidery And Sewing Machine , you will be surprised to see the diverse functionality all in a single machine. Brother International Corporation has embraced the technology with this machine. At an affordable price, this machine would provide you an incredible value.